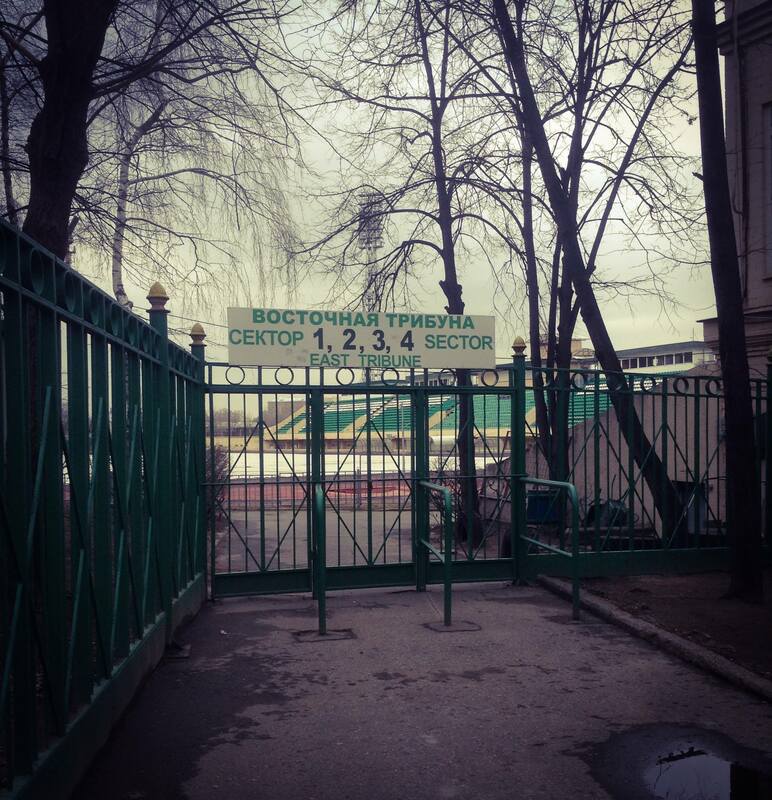 Torpedo Moscow and its historical Eduard Streltsov stadium are important cornerstones in Russian football history. But as Spartak Moscow rejoices in the bright architectural splendor of its new home at the Otkrytie Arena, and traditional rival Dinamo Moscow are looking forward to the opening of its futuristic VTB Sports Complex, Torpedo remain a club still very much in the past. The impending arrival of FIFA’s World Cup in three years time for Russia 2018 has seen new modern architectural concepts captured in Russian stadium architecture. These projects have injected fresh life into some of Russia’s once solidly traditional football facades. 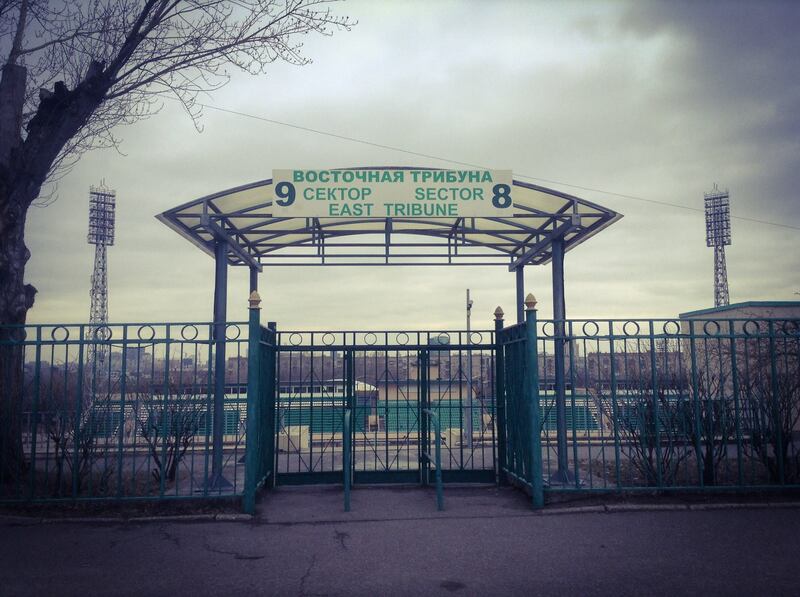 But in southeastern Moscow, close to the old ZiL factory, Torpedo Moscow is currently unable to play at its Eduard Streltsov stadium. Instead the club is based in the outskirts of the city in the Saturn Stadium located in the rather obscure Muscovite suburb of Ramenskoye. 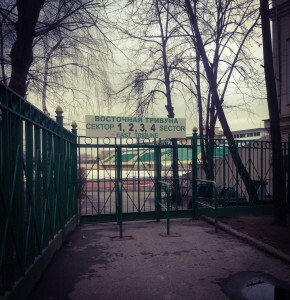 Entrance to Eduard Streltsov Stadium. Built in 1959 the Torpedo Stadium was created using traditional Soviet stadium architecture of an open terrace complete with a running track. Torpedo Moscow, by 1959, was an established Soviet Vysshaia Liga club. The move to its own stadium, however, was a huge factor in its championship successes. Twice in the next ten years (1960 and 1965) it would finish above Dynamo Kyiv to win the esteemed Soviet league title. The 1965 title win was especially memorable thanks to numerous goals from Torpedo legend Eduard Streltsov. 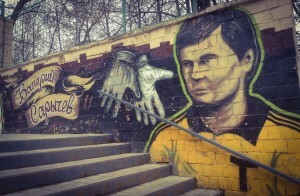 Streltsov, often deemed the Russian Pelé, was the inspiration for an entire Russian football generation, and would later become the namesake of Torpedo’s football stadium. The following year’s European Cup draw saw Torpedo matched with the great Italian club Internazionale. The game in Moscow, however, did not take place at the Streltsov but instead Torpedo hosted the Italians at the much larger Central Lenin Stadium (today Luzhniki). The eventual 0-0 draw would not be enough to overturn the first leg’s 1-0 defeat. It would be over ten years (in 1976) before Torpedo would win the Soviet Vysshaia Liga once again. Entrance to Sectors 8 and 9. 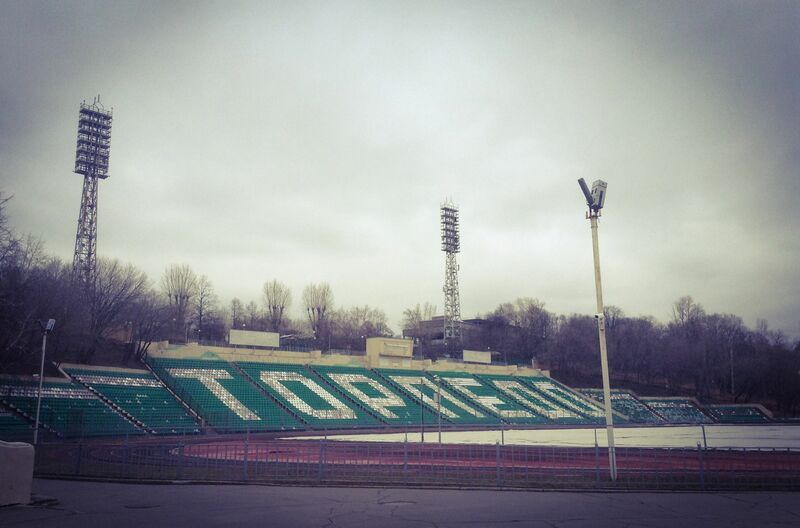 Back then the Torpedo Stadium was deemed too small to host European matches, and while the club was at least able to compete in national competitions in their historic ground; today the stadium is mostly empty. Owned by a private investment consortium Onexim Company, led by the Russian oligarch and Brooklyn Nets owner Mikhail Prokhorov, the newly promoted Torpedo are unable to pay the stadium rental fees required to use the facility. There are even rumours that the stadium could be demolished in order to make room for a more modern facility. 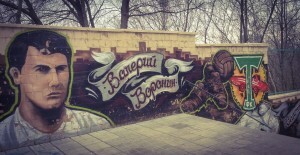 The graffiti of Eduard Streltsov. Outside the Eduard Streltsov Stadium, at the downtrodden entrance gates stands a large statue of Streltsov himself. 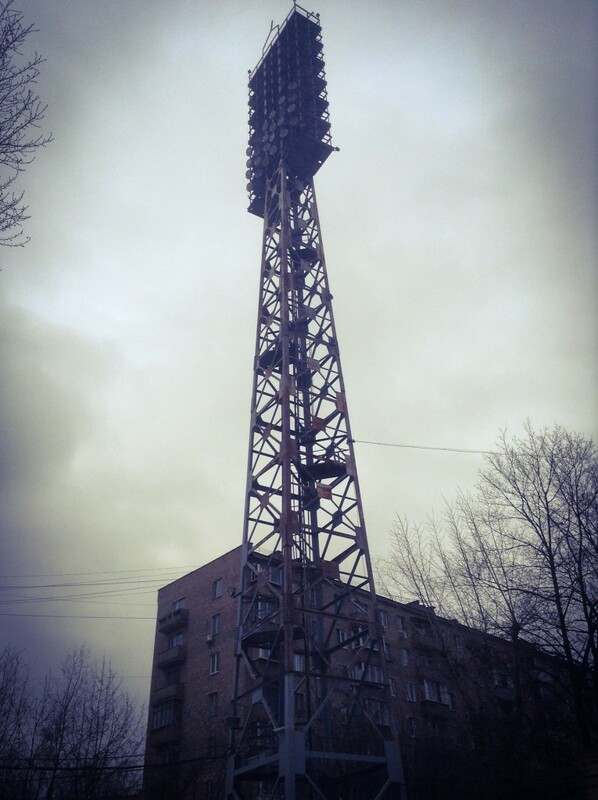 Unlike the many Soviet era monuments that once littered Moscow’s streets – many of which now lie rotting near Gorky Park, the figure of Streltsov remains standing proud outside, only dwarfed by the huge floodlights of the stadium that bears his name. One of the many Torpedo legends. 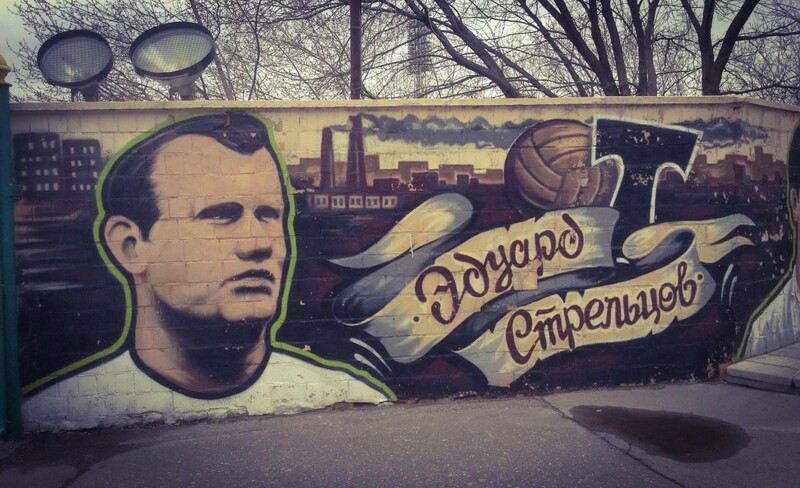 Surrounding the stadium you can find graffiti related to Torpedo’s rich history. Graffiti artwork is often an unwanted eyesore for many people in society. Irregularly strewn, often illogically thought out and secretly tagged across train platform walls or disused factory buildings, its occurrence in the football world has become more increasingly more common particularly across mainland western Europe. But outside the Torpedo Stadium one can find some of the most beautiful football related graffiti in Eastern Europe, all dedicated to the history of Torpedo. Numerous players and coaches from Viktor Shustikov to Valitin Ivanov stand in vivid color as those who have been part of the club’s past are captured in bright colorful paint. With the club having undergone numerous name changes over the years (Torpedo has been AMO, ZiS, Torpedo Luzhniki and Torpedo Moscow), the artwork is also rich in colors displaying the various historical logos, the only constant being the T (standing for Torpedo) at the center of the logo. The floodlights of the stadium. Entering the stadium the tall floodlights stand powerful yet rusty and somewhat ill maintained while the vast open pitch during winter sits exposed to the frost and ice of the Russian cold. 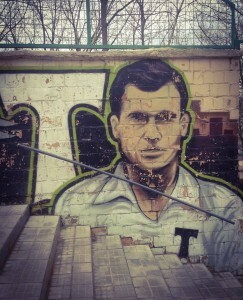 The painted murals are a strong contrast to the stadium, colorful, interesting and artistically maintained – a memory to the great successes of the onetime school of Russian football. The mural of Valeri Sarychev also known as Shin Eui-son. Developing the stadium and turning the stadium shell into a modern arena is the ultimate aim. Moreover, it’s hoped that this will be a place fit for the production of the next generation of Russian players. As a company team Torpedo did not receive the same form of government support as other clubs, such as the team of the Ministry of Defense CSKA Moscow or the club of the Interior Ministry Dinamo Moscow. Yet the lavish support of the ZiL car factory meant that the club was able to become one of the most recognized football brands of the former Soviet Union. After the fall of the Soviet Union, ZiL entered a phase of economic trouble and in turn Torpedo’s role in Russian football diminished. The club is now Moscow’s smallest first division team and its stadium will only play a minor role in the 2018 FIFA World Cup where it will most likely be used as a training facility. The mural of Valerii Voronin. Even though the club has now returned to the Russian Premier League, Torpedo remains the weakest link in Moscow’s football having long been surpassed by the big four of the capital, Lokomotiv, CSKA, Dinamo, and Spartak. Also the recent actions by the Torpedo’s fans have done considerable damage to a club with a once proud reputation. At the same time, however, the murals displayed in this article show the illustrious history of a club that was once considered a Soviet legend. A native of the ‘granite city’ of Aberdeen in Scotland with a passion for football, writing, photography and travel – Damon has spent most of his life watching football religiously. His main interests are European club football, fan culture and the stadium. Writing largely as a hobby, Damon somehow manages to combine his sense of global wanderlust with a love of writing – producing articles, images and insightful research for a variety of online and print publications. Saw Scotland Under 21 team beat Russia here in 1995. 29th April I believe and I think Hibs Kevin Harper got one or two goals that night. Coldest I’ve ever been at b a football match. Senior team drew 0-0 the following night at the then un-roofed Luzhniki Stadium. Was in Moscow at the same time as Andy, and was at that 0-0 game too. The Vaseline was particularly thick on Leighton’s eyebrows, I recall… I was living there on a student exchange for a few months, and got to know a Torpedo fan who took me along to a home league game, so I’m intrigued to see pictures of the place. Was a bit rattled by the big brawl that took place in response to some Spartak Vladikavkaz fans in the main stand who couldn’t hide their delight at winning (on their way to the title, as it turned out), but it was fascinating to experience.